Non slate pool tables are more affordable than those that use it. If you aren’t familiar with slate, it is a solid material used underneath the felt on the top of the gaming area. This is in place to give the surface a smooth and level element so that the balls move around properly on it. When you play pool on a non slate table it doesn’t mean that you won’t still enjoy the game. However, the same level of quality won’t be there as with a slate one. On the plus side though non slate tables are more affordable and that can mean you are able to afford one in some situations. When slate isn’t used there is some other type of material that is in its place. The ones most often used include slatron which is a type of synthetic material. Basically it is nothing more than some layers of plastic that are on top of cheap particle board. Sometimes what is known as fiberboard will be pressed around the particle board to make it more durable. You will find different levels of quality when it comes to non slate tables. It is a good idea to ask what types of materials that the backing is made from as well as the surface underneath the felt. That way you can get one that is as well made as possible. There is really no point in paying for a very low cost pool table that is non slate if it won’t last you very long. 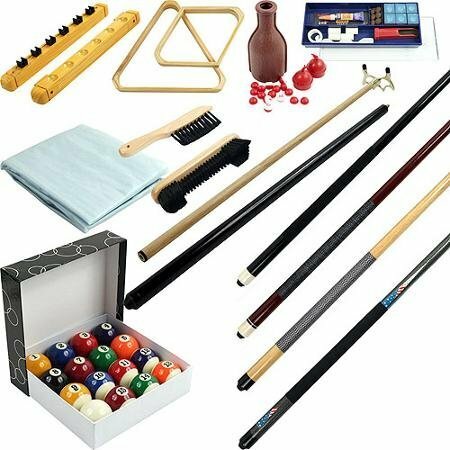 The more you can find out about the design of the non slate pool table the better choice you will make. If you will play your pool table often then non slate may not work to your advantage though. This type of product is more likely to warp which means that the playing area won’t remain level. If you have children that will play the pool table they can be harsh on it and rough. As a result such damage can occur so you need to take that into consideration. Also, you need to be very careful that moisture doesn’t get onto a non slate table. Even though you can remove it from the surface in most instances it can seep through and ruin the other materials. If you do encounter any types of spills or water leaks, be sure they get cleaned up as quickly as possible. This process will help to minimize the possible damages to your pool table. The decision to buy a non slate table is one you need to carefully consider. You don’t want to invest in one and then later on wish you had paid more for one with slate. Take the time to try out some non slate pool tables though that are on display. That way you can find out for yourself what the playing will be like. If you find that you are accepting of it then you may as well save some cash and look into this option further.